Indoor air quality has always been a hallmark of LEED certification, and the new LEED v4 rating system raises the bar significantly when it comes to low emitting compliance. 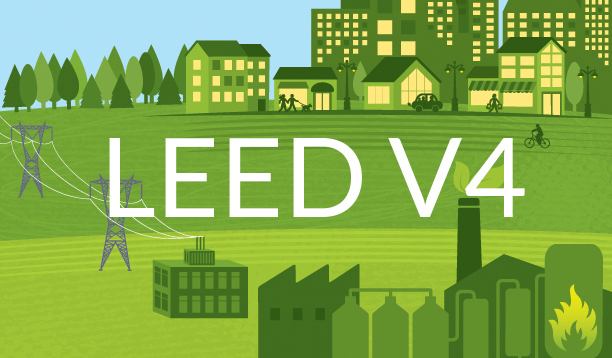 Previous versions of LEED have treated low emitting materials as 5 separate issues contained in 5 separate credits each worth 1pt. Adhesives and sealants comprised the first credit, followed by paints and coatings, flooring systems, composite wood and then systems furniture. Among the 5 credits were 3 different approaches to measuring low emissions based on product category – VOC content in grams per liter (g/l) for wet applied products, third party emissions testing for flooring and furniture, and no addition of urea formaldehyde to manufacturing of composite wood products. In v4, all of these issues have been combined into one credit called Low Emitting Materials that is worth a total of only 3 possible points. And the credit scope has grown to include a sixth category of products – ceiling, walls, thermal & acoustic insulation. The compliance approach has been simplified to reflect emissions testing as the primary protocol, with wet applied materials still carrying the VOC content requirement like a cherry on top. Flooring and composite wood still require all or nothing 100% compliance, along with the new ceiling, walls, thermal & acoustic insulation category. The two wet applied product categories, along with furniture, use 90% emissions compliance thresholds based on volume and cost respectively. To achieve 1pt, you must comply with 3 categories. For 2pts, you must comply with 5 categories. It takes compliance with all 6 categories to get all 3 pts (vs. the 5 pts you would have received for fewer categories in the previous systems). You can still resort to a VOC budget as an alternate compliance path for products without emissions certification. But to use it, products are considered assemblies of one of the following surfaces – walls, ceilings, floors, insulation or furniture – and each layer of the assembly must comply with emissions over at least 50% of its surface area. It’s unclear that adding more layers of product compliance would help resolve an issue concerning one specific product without an emissions certification. Emissions testing is already common to the paints, flooring, furniture and composite wood industries, so look to those product categories for opportunities. The market will undoubtedly catch up with these third party emissions requirements as demand grows, and more products will certainly become available over time. In the meantime, choose your compliance categories wisely and specify your products carefully as early as possible. Keep in mind that larger manufacturers are more likely to have invested in third party emissions testing and also in environmental product declarations and transparency initiatives that might offer synergies with Material credits. Look to the paints, flooring, furniture and composite wood product categories for compliance.